People will have a chance to look around the new Guernsey Breast Unit on Saturday 26th October 2013. Please click here for more information. 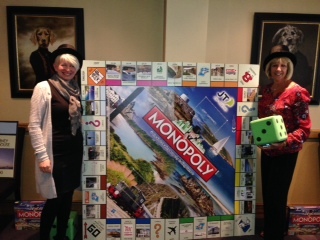 The Pink Ladies are proud to have been voted to have a square on the Guernsey edition of the Monopoly board game which was launched this week. It will make a fabulous Christmas present ! Please click here for more information. The Sunset Walk Part 2 ! 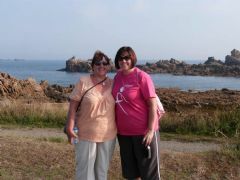 Joanne Le Messurier had all signed up and collected sponsorship for the Pink Ladies Sunset Walk on 22nd June but unfortunately ended up in hospital and had to undergo surgery on the weekend of the walk. Please click here for more information. The Dodd family organised another bingo fundraiser for the Pink Ladies which was held at the Royal British Legion Hall, L'Islet, on 30th June. Please click here for more information. 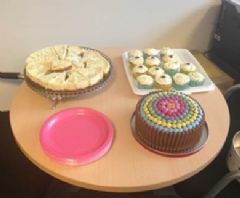 Generali Guernsey raised GBP113.12 from a cake sale last Friday so thank you to the bakers and for all the staff who supported this ! Car-booters brave the cold for Pink Ladies MORE than 35 stalls filled Alliance car park on Sunday for the Pink Ladies’ car boot sale. Clothes, games, toys and cakes were some of the items on offer and the event raised £591.58. Please click here for more information. This Easter Egg was donated by Guernsey Bunny Boarding to use in the raffle at the Pink Ladies car boot sale on 31st March. Please click here for more information. Scarlet Hilton-Smith works in the rental department at Sarnia Estate Agents and has asked the Directors if she could support a charity by donating everytime a property is rented. They thought this would be a great idea. Scarlet has chosen the Pink Ladies as it is close to a lot of peoples hearts. They have let Scarlet "dress" her company car with pink accessories, including pink eyelashes on the head lights! And the more properties she rents, the "pinker" her office can become! Thank you Scarlet and Sarnia Estate Agents for your support and let's hope the office will be very pink very soon ! Prices range from 16 to 22.50 and the multipack costs 28 for two bras. They also have a sale on of up to 70% off previous seasons. Please click here for more information.